Egyptian Foreign Minister Sameh Shoukry discussed peace efforts in the Middle East and the fight against terrorism with UN Secretary-General Antonio Guterres in New York on Tuesday, the foreign ministry said. The talks focused on moves to secure peace in Libya and Syria, the Palestinian issue and supporting the UN’s Palestinian refugee agency following aid cuts by the US earlier this year as well as international counterterrorism efforts, the ministry said in a statement on Wednesday. 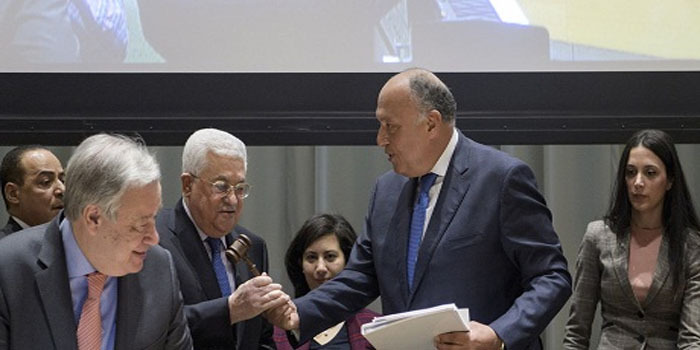 Shoukry on Tuesday handed over the annual rotating chairmanship of the Group of 77 (G77), a coalition of 134 developing countries, to Palestine, during a ceremony in New York. Egypt was last year’s chair of the bloc, along with China. Palestine was elected as 2019 chair by the foreign ministers of the member states in September 2018. During its presidency, Shoukry said in the statement, Egypt pushed for the eradication of poverty and the implementation of a fair and equitable international economic order, while focusing on youth, employment and women’s empowerment, the ministry’s statement said. Also on Tuesday, Shoukry met with Achim Steiner, head of the UN Development Programme, where they discussed mutual cooperation and recent developments in the Middle East.